I am finishing my basement, including a full bath that was roughed in by the builder, and I have a few questions about the bathtub install (a basic 30"x60" porcelain over steel tub). 1. When I attach the drain underneath it raises the tub up slightly. Do I need to shim the tub up, or is clearance below floor level expected? If so I'll need to bust out some concrete. 2. I understand that you connect the overflow, drain, and roughed in 1.5" pipe with a T, however the drain is about 2" off from where it needs to be, probably due to the concrete guys knocking it out of place. Does the vertical pipe coming down from the overflow need to line up directly over the roughed in pipe, or is it acceptable to use an elbow? My guess is that the answer is to break up the concrete to allow clearance and move the pipe into place, but I want to ask to be sure. The hole should be large enough to allow the drain to set in the hole and connect to the trap through the brass tailpiece from the tee. If that's not the case, enlarge the hole. 2 inches off is unacceptable. So is adding a elbo to the tailpiece. 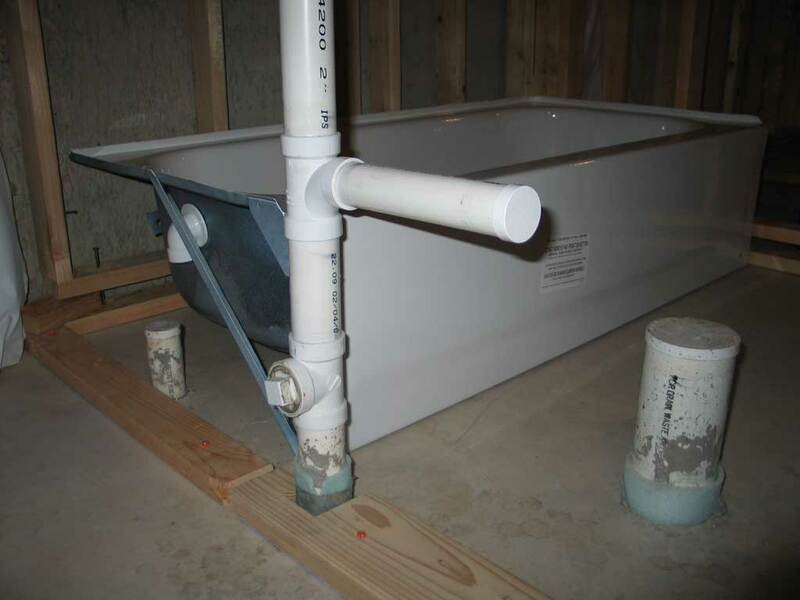 Let's see, the dap out's off to the point where you can't set the tub over it and the trap's off by 2 inches. The cement guys dap out a tub hole according to where the trap's located. If the traps off 2" then the dap out's off 2". It's not the cement guys fault. Your plumber missed a measure. What happens now is that you have to bring everything back into line. If you have plumbing skills you can break out cement back along the drain line and cut the trap out. Then add fittings to bring the trap raiser directly under the tail piece from the tub. "My guess is that the answer is to break up the concrete to allow clearance and move the pipe into place, but I want to ask to be sure." You may be able to get the plumber back to correct his work but one thing's for sure. Everything has to line up before the tub can be set and connected. Thanks, Tom. Am I correct in saying that a dap out is an area where no concrete is poured to allow access to the trap, etc. If so, there is no dap out, there is simply a 1.5" pipe sticking out of the concrete floor by about 4 inches. Regarding it being 2 inches off, the wall is not in yet so I can correct for the position of the tub in order to align it right where it needs to be. This doesn't account for the insufficient clearance under the tub, though. Thoughts? The problem here is that you were roughed in for a shower and not a bath tub. The average rough in for a tub's trap is 15 1/2" off the side wall and 1 1/2" in from the wall the drain's at. These measures are to center of the trap raiser. You're going to have to reconfigure the rough in and create a 14 X 14" dap out to connect the drainage in your tub. More questions? Click on back. Now that I'm at home looking closely at it, here's what I found: The drain is 2" pipe, and is 19" from the sidewall, so when you account for the 3 1/2" 2x4 wall it's 15 1/2" to the center of the drain. The drain is supposed to be 1 1/2" from the faucet wall, but is not square with the plumber's markings on the concrete wall. I have attached a photo that shows the layout. Most of the shower bases I've seen have a center drain. I plan to call the builder on Monday to see if the plumber can explain how this is supposed to go, but the builder's plan shows a tub. Thanks for all your help! If I imoved the tub back against the plate how far off would the drain be? "Most of the shower bases I've seen have a center drain." That's so with a manufactured shower base but with a tile base the drain can be any place. Mine is against the back wall. It is indeed a tub drain, they run 2" in basements and apparenty the plumber missed the mark. Basically I busted out the concrete around the drain and offset the trap using 2 - 22 1/2 elbows. The trap was a good 12" below so I had plenty of room to work. I cut off the pipe, then put in elbow/street elbow to offset, then reducer to 1 1/2", and finally hooked up the drain and over flow. I dry fit everything together first, and put the tub in the right spot complete with a 2x6 wall all the way across. Next question: I had intended to install two lavatories, then a small wetbar sink on the opposite side. I found out that the maximum number of fixtures on a 2" wet vent is 4, including water closet and tub. Are there any reasonable options to add that third sink? Otherwise I'll just install one lavatory and save the headache. "Next question: I had intended to install two lavatories, then a small wetbar sink on the opposite side. I found out that the maximum number of fixtures on a 2" wet vent is 4, including water closet and tub. Are there any reasonable options to add that third sink? Otherwise I'll just install one lavatory and save the headache." "You wish to add another lavatory and a bar sink for 2 more fixture units for a total of 8 fixture units. With a 3" stack you are allowed 10 fixture units on a 2" vent." "908.4. Horizontal Wet Venting. Horizontal wet venting is limited to drainage piping receiving the discharge from 1 and 2 fixture unit fixtures that also serve as a vent. All wet vented fixtures shall be on the same floor level. Fixtures with a continuous vent discharging into the horizontal wet vent shall be on the same floor level as the wet vented fixtures. Horizontal wet vented sections shall be sized at a minimum of 2 inches (50.8 mm) in diameter and not to exceed a total flow of 4 fixture units." Since a bathroom group is 6 fixtures units as you stated, which fixtures are counted in the 4? Everything except the toilet? The other issue is I'm not sure I could do the second lavatory in the bathroom anyway, since the distance from its trap to the vent will be greater than 5' (as you can see in the picture I posted earlier, the vent/horizontal drain is between the toilet and tub). Anyone care to share their preference for the lever type bathtub drain vs the lift and turn type. I have always had the lever type stopper but I don't think they have worked real well after they get a little age on them.